In 2018 we launched the first ever corporate sustainability report based on the holistic Planetary Boundaries framework. It’s a great step towards understanding our entire impact on the world. The report is based on a research framework that illustrates the safe operating space and boundaries of the planet’s limitations, “the Planetary Boundaries”. We have used the Planetary Boundaries framework to understand the impact of our operations and to prioritise our policies. We aim to know the ‘butterfly effect’ of everything we do, both positive and negative. Our mission is to not just limit our negative impact on the planet, but to have a long term positive influence. 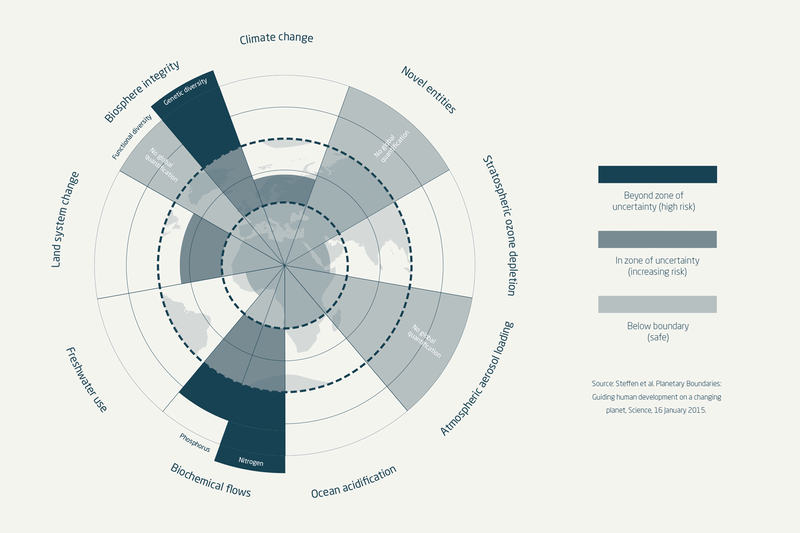 The Planetary Boundaries Assessment is a key foundation for that ambition. The report has assessed the impact of our fibre use – from understanding how sheep farming and grazing affect the impact that wool garments have on biological diversity in local ecosystems, to its impact on climate change on the global scale for example. We plan to repeat and expand the project every three years, not only to benchmark progress but also to continue to go into more granular detail as we gains further access and insight from our suppliers and customers across the globe. The Planetary Boundaries: The light blue zone is the safe operating space (below the boundary), medium blue represents the zone of uncertainty, with an increasing risk of disrupting Earth system stability; and dark blue is the high-risk zone, pushing the Earth system out of a stable Holocene-like state. The Planetary Boundary itself lies at the dotted line. We aim to know the ‘butterfly effect’ of everything we do, both positive and negative, so we can build a new model of production, innovation, sales, customer experience and resource management that inspires the rest of the industry to follow suit. The Planetary Boundaries Assessment was conducted in collaboration with Albaeco and is the first of its kind. Albaeco has been working as strategists in sustainable development for 20 years, and have close links with the Stockholm Resilience Centre and the latest research in the field. Subcribe to our newsletter and be the first to know about products, sales and news. Houdini Sportswear. All rights reserved.